NEW YEAR’S RESOLUTION UPDATE: PRACTICE MAKES PERFECT (SORT OF) - What About Watermelon? My New Year’s resolution this year is to compete in a watermelon eating contest. I’ve identified the contest and interviewed competitive eaters. With six weeks to go before the big day, the only thing left to do is get a few watermelon-eating practice sessions under my belt to test my capabilities and refine my technique. Like I mentioned before, I used to be a semi-professional competitive eater, so “practice sessions” are nothing new to me. Before any eating contest, it’s a good idea to practice at least once to determine what sort of challenges you might face on game day. Even if it’s a food you’ve eaten 100 times in the past – whether it’s hot dogs, apple pie, ice cream, or watermelon – it’s a completely different eating experience when you’re consuming mass quantities of it in a short period of time. 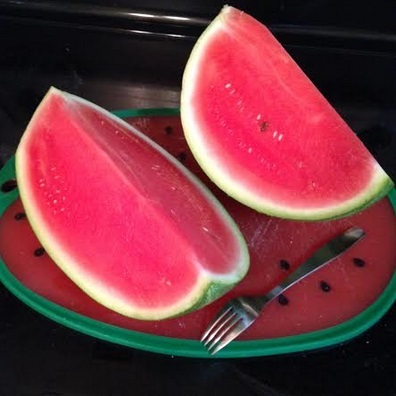 For my first training session (and all future sessions), I practiced with half of a medium-sized watermelon, cut lengthwise into two equal quarter-melon wedges. My goal: to consume both in about three minutes. I’ve been known to eat on quarter-melon wedge in a single sitting, but I’ve never eaten two, and I’ve certainly never eaten two in the span of 180 seconds. With my wedges in front of me (that’s them above next to a fork for perspective) and wearing my favorite “eating shirt” (yes, I have an eating shirt), I was ready to dig in. I warned my wife that things might get messy and she wisely suggested that I move my practice run to the picnic table on the back porch. She’s pretty smart about stuff like that. So how’d it go? I finished both wedges in about five minutes. Not quite as fast as I had hoped, but not a terrible first effort, either. I was also right about things getting messy. By the time I was finished, my face was soaked in watermelon juice and my eating shirt was drenched, too. That’s okay, though, because it has more than its share of stains – each one with its own story to tell. I plan to try at least two more training sessions before the contest on July 4 to see if I can improve my speed and technique. I’m pretty sure there’s room for improvement, and I’ve already got some ideas for how to make that happen. Stay tuned! I wish you much success completing your task. Thanks Ellen! I’ll keep you posted on how everything turns out!